HeartSciences is delighted to have been highlighted as “Start-Up to Watch” in the June 8, 2018 issue of the MedTech Strategist. The article titled “HEARTSCIENCES: ARTIFICIAL INTELLIGENCE IMPROVES FRONTLINE RISK STRATIFICATION FOR HEART DISEASES” discusses HeartSciences’ role in addressing the current challenges and significant unmet need to identify heart disease at an early stage and reduce the high prevalence of expensive diagnostic testing with low yields. The article highlights the enormous opportunity for HeartSciences’ breakthrough MyoVista® Wavelet ECG (wavECG™) technology to benefit patients and to reduce health system costs and references a recently published study titled “Prediction of Abnormal Myocardial Relaxation From Signal Processed Surface ECG” in the Journal of American College of Cardiology (JACC). “It is an honor to be recognized by MedTech Strategist as a Start-Up to Watch,” said Mark Hilz, CEO. HeartSciences is working to bridge today’s “diagnostic gap” in cardiac care by providing low-cost effective solutions that help to identify patients prior to experiencing an adverse cardiac event, such as a heart attack. HeartSciences is advancing the field of electrocardiography through the application of wavelet signal processing and artificial intelligence to develop next generation ECG technology. Wavelet signal processing is currently used in many different industries as an important tool to provide insights and new valuable data related to spectral analysis of a signal. 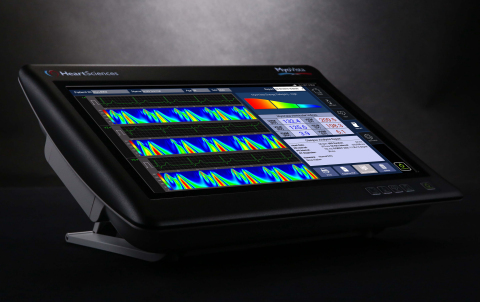 HeartSciences’ MyoVista wavECG Cardiac Testing Device is a 12-lead resting electrocardiograph utilizing continuous wavelet transform (CWT) based signal processing. Patented informatics focus on energy related information rather than conventional voltage-based information. HeartSciences’ mission is to enable accurate, affordable screening for the early detection of heart disease.